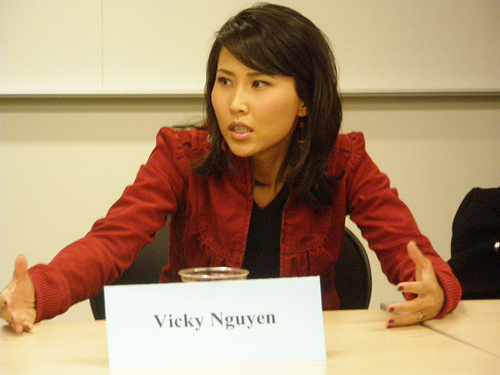 Vicky Nguyen is a television reporter who works as the San Jose Bureau reporter at KNTV in San Jose. Previously, she worked as a collaborator at Phoenix, Arizona's KSAZ-TV channel. Nguyen grew up in San Francisco. She graduated from elementary, junior high and Piner High School with good grades, which led her to obtain a scholarship with the University of San Francisco. Nguyen followed her study ethics at the university, where she graduated as valedictorian with a major degree in communications and a minor one in biology. Shortly after graduating, Nguyen was offered a job at a local station in Orlando, Florida. Lured both by the opportunity of working as a television reporter for the first time and also by the idea of having major biology themed parks nearby, she moved there and began to work for Central Florida News 13. Nguyen accepted an offer by a Nevada television station after her stint in Orlando was over. Having returned to the American west, she became a local celebrity in Reno, after joining the news team of the KOLO network. In January of 2004, Nguyen moved south, to Phoenix, to join Fox 10's team of reporters. As it often happens with Phoenix news reporters, she has become a local celebrity there as well, and is well known for her coverage of difficult subjects and news, such as the shootout in 2005 between a group of Phoenix police officers and an armed man inside an exclusive residential area. In January of 2007, Vicky moved to NBC O&O KNTV and now reports for the San Jose Bureau as well as a field reporter.